Steam Productions, in cooperation with Broken Mirror, is very excited to announce its next show, Dennis Kelly’s Orphans, at the Mechanics Institute from August 8, 2014. 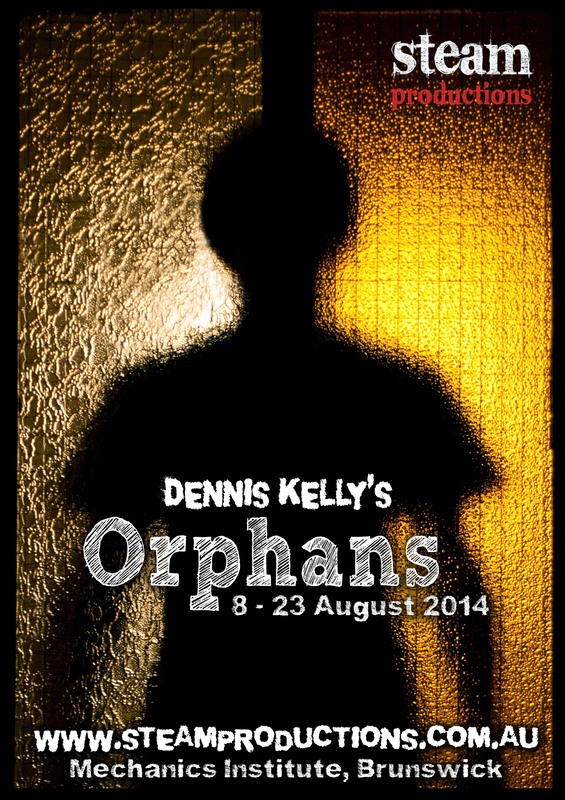 Written by Dennis Kelly (writer of Matilda for the Royal Shakespeare Company), Orphans was first presented by Birmingham Repertory Theatre Company and Traverse Theatre Company in association with Paines Plough at the Traverse Theatre, Edinburgh on 31 July 2009. Orphans tells the story of Helen and Liam, a sister and younger brother orphaned in childhood as a result of a fire, and the strong familial ties that bind them as a result of growing up alone and together in the ‘system’. With Helen now happily married to Danny, with a young son and another on the way, Liam arrives on their doorstep, covered in blood, frantically telling the story of a young lad he desperately, and futilely, tried to help when he discovered him, beaten and badly injured, on the street. Helen and Danny try and understand and calm the frantic Liam, and piece together what happened and what they will do about it. Things get complicated when inconsistencies begin to appear in Liam’s story, by which point events have been set in motion that will have lasting impacts on all their lives. This will be our 5th production, and our first international work, after last year’s original Guardian Angel, Con Nats’ soulful one man show Me & Shirl, Matt Cameron’s beautiful Australian play Ruby Moon, and Sydney’s wildly successful collection of Anton Chekhov’s From Chekhov with Love. ** Pay as you feel (Monday 18th) Reserve your tickets here for this special event.